Spanish Red Sow Bugs are very rare. They are red in color. They are good breeders and are raised in the same fashion as regular Sow Bugs. They can be raised in a container with some potting soil. Keep bedding moist but not wet. Add leaves and small twigs to the culture for food or get some of Worm Man's Sow Bug Food to keep them healthy. You will have thousands of Sow Bugs in no time when starting with a small culture. Each culture contains 15 Spanish Red Sow Bugs with food and bedding already in the container. You can raise the Sow Bugs right in the container they are shipped in until they overcrowd it. The container has a metal screen lid. 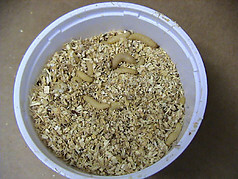 We will also include a sample of our Sow Bug food. Just give a small pinch every week. Free Shipping!